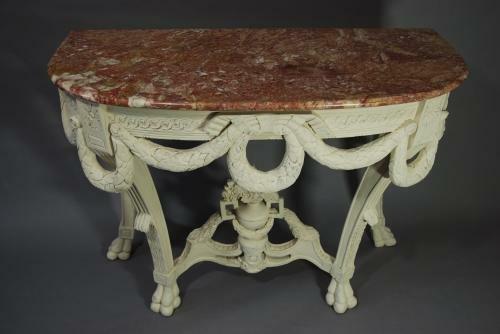 An early 20thc carved wooden console table with a marble top. The marble top is a pink,red & cream colour. The wooden base is painted in a light cream colour. The base has a carved frieze with intertwined circle decoration. There is a central decorative carving of a large laurel wreath & swags. Four reeded & leaf carved legs lead down to stylised paw feet with a central stretcher carved with a vase of flowers with laurel. This is ideal as a stand alone piece in a hall or bedroom.